Ever go through a phase where you just want to buy anything and everything by a particular designer? 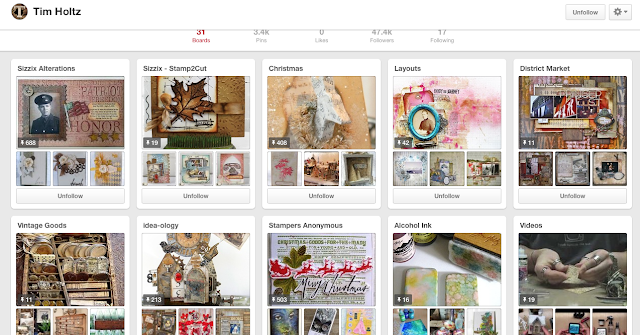 Me, I'm in a Tim Holtz phase. I was surfing the new products introduced during CHA and that made me go to a few of my favorite online stores. I'm resisting the temptation to pre-order but it's really hard. Beside Tim Holtz, I'm waiting for a few Heidi Swapp products for the Minc (hello new foil colors) and of course as I mentioned last week the new Misti Stamp Tool. I'm not vintage and steampunk either. I like the challenge of taking it and making it more "me". Cats and birds are on my list. I want them all :) I have an HP laser printer (HP 1102). I've run my neenah 80lb solar white through with no problems. I'll be posting a project I did later this week using the neenah and foiling. Thank you for the laser info. I found that 65# card stock - the stuff sold under the Recollections name at Michael's - works fine. And since it's going to be layered, it works great. But I will look into the HP one b/c my toner seems to shadow itself on the rest of the card stock. I just bought Crazy Birds and their die cuts from SSS for $29.99 total. What a steal. I'm so excited. I look forward to your foiling post. I love the Bird Crazy stamp set and dies. I can't wait for the mini version to come out!!! I have pre-ordered a ton of Tim Holtz stuff from CHA 2016. I want those crazy Cats! I didn't know that there are new foils coming out for the Minc, but I am glad to learn it! I love my Minc and would love some more colors to use. Oh yes! do a YouTube search for Heidi CHA 2016. OMG! i want all the new colors. Christina, I'm with you...love TH products. I have original Bird Crazy stamps/dies and would like to get the mini of stamp/die set. Also want to get makers of most recent colors. I'm wanting to try either distress paint or stain...not sure which on. I did break down and purchase MISTI...LOVE it. I have a few stains and paints, I use the stains more often. I can't wait for the small Misti to get here. I want to try the new Distress crayons. I was able to take a class with him on LI. He was as kind, patient, funny and generous as you see on videos. LOL Christina you poor thing! When you get that itch to go shopping... you normally give in... at least I know that I do! HAHA! I really want to get my hands on Tim's distress crayons.... I am really digging those.... and while I like the smaller size Misti... I have the original size so I really don't see the need to invest that kind of money for the same thing just in a smaller ratio, ya know? And I really want to get my hands on some of the new Spectrum Aqua Glitter water markers... they look divine! I hope you are having a great weekend thus far.... are you guys going to be watching the super bowl tonight? Who are ya rooting for? Hi Jo. I have a terrible itch to shop, I did break down and ordered a few stamp sets last week. They came this weekend so I can't wait to dig in. I didn't get the larger mist, so I can't wait to give it a try. I should be getting it early March.